Good morning! 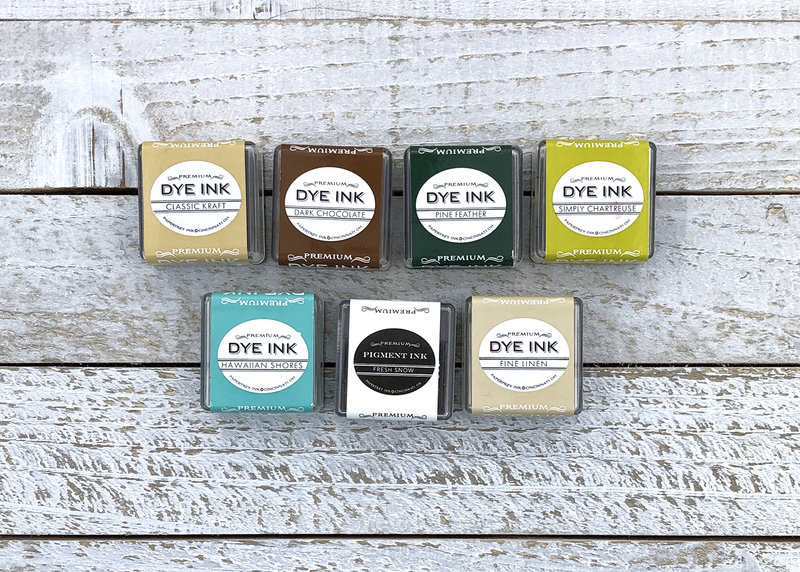 Welcome to this month’s color installment! Today I decided to go on a hunt for a few new Christmas color combos. Although I have my favorites like the candy-colored Christmas palettes I shared last month, I’m always looking to try something new. I came across a post on HGTV about “Fresh Christmas Colors” to incorporate into Christmas decorating. Perfect! Although not entirely the focus of the article, I found myself gravitating to the more neutral palettes included – green and brown, parchment and white, turquoise and white. 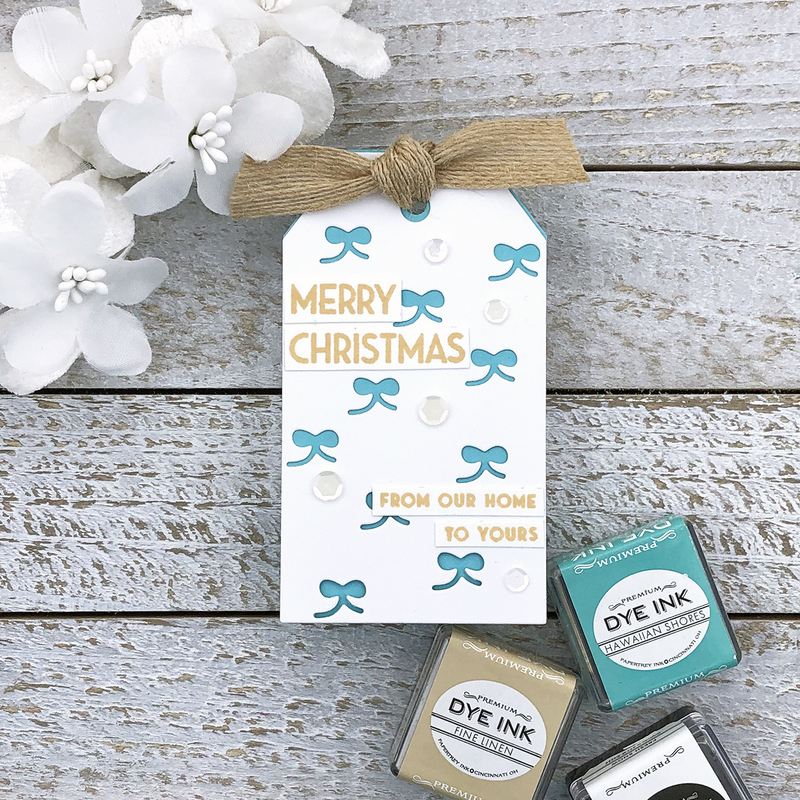 Paired with the right images and sentiments these can be great colors for Christmas, especially if you’d like a break from the traditional red and green. First up, green + brown. According to the article, it’s a good idea to take cues from Mother Nature and to consider layering several shades of green for added interest. I chose Classic Kraft and Dark Chocolate for my browns with Spring Moss, Simply Chartreuse and Pine Feather for my greens. This palette lends itself to a woodsy look, so I pulled out Text and Texture: Wood Slices for a patterned tag. I added the sentiment and leaves in Pine Feather and Simply Chartreuse on a strip of Spring Moss cardstock and finished it off with a plain tag in Classic Kraft for writing a sentiment and a green ribbon. I love the results! I will definitely be using these colors again. Next, parchment + white with a metallic. According to the article this less is more approach is timeless and easily adaptable, resulting in a look of understated elegance. Adding the metallic breaks up the neutrals for a bit of a pop and any metallic will work – silver, gold, bronze, pick your fave! I do love a less is more approach, so this one was a no-brainer. 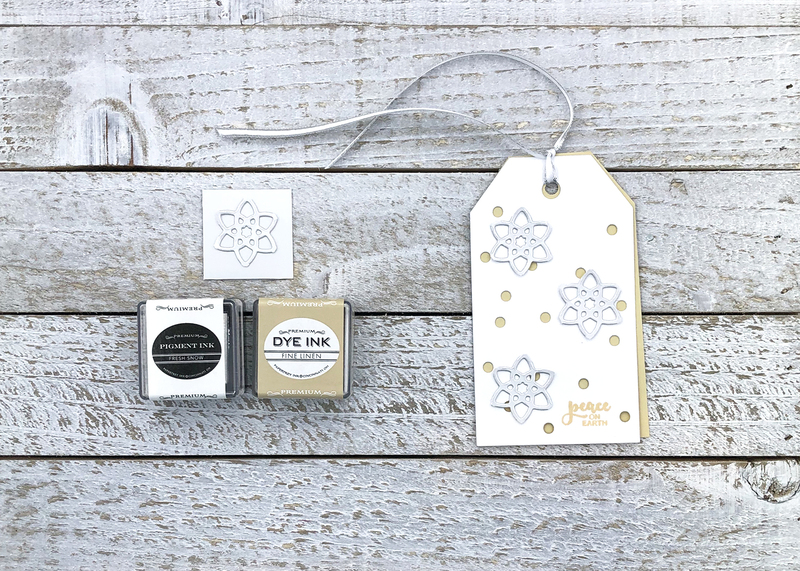 Fine Linen is my parchment color and after digging around for a metallic, I settled on silver and immediately thought of snowflakes, so that became my focus. 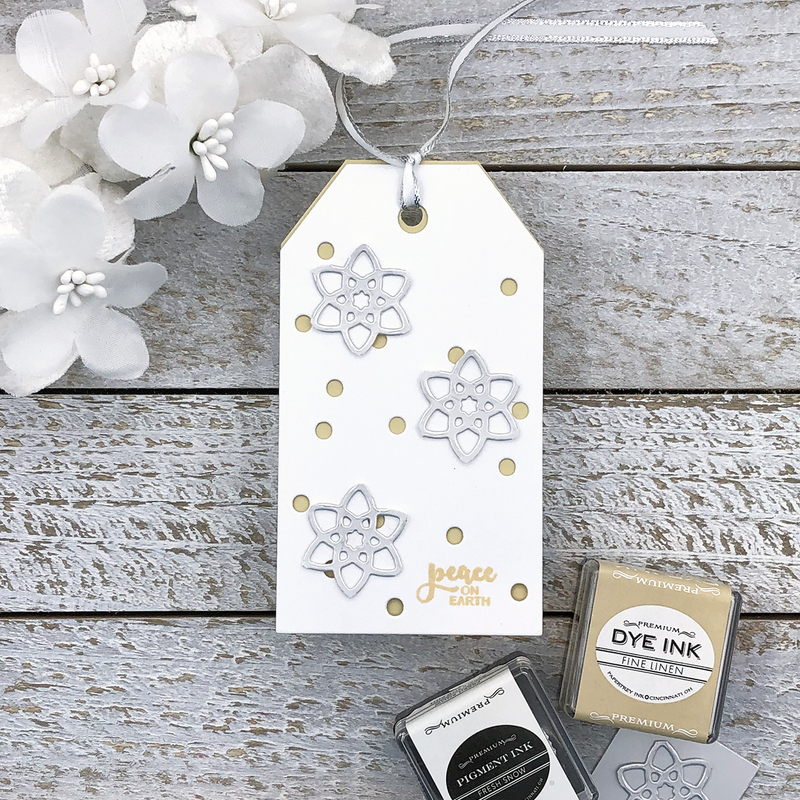 The Pitter Pattern Tag Dies are perfect for adding layers of color to tags and the one with the circle cut outs reminded me of snow. Add a few silver snowflakes and silver edged ribbon along with a small sentiment and this clean and simple design is complete! And last but not least, I landed on turquoise + white + parchment. 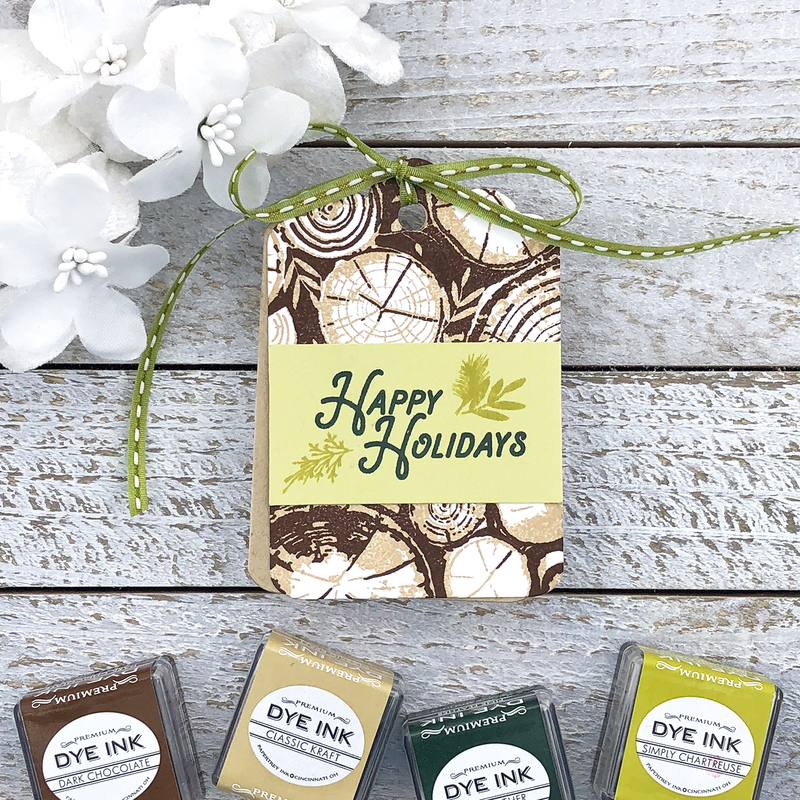 Or in Papertrey colors, Hawaiian Shores, Stampers’ Select White, and Fine Linen. Turquoise is often paired in smaller doses with red and green or other jewel tones for Christmas, but here it is the main color along with white, while Fine Linen is an accent color. While it’s a little less expected as a focal Christmas color, it works nicely in that role, especially when used on images like bows and ornaments. 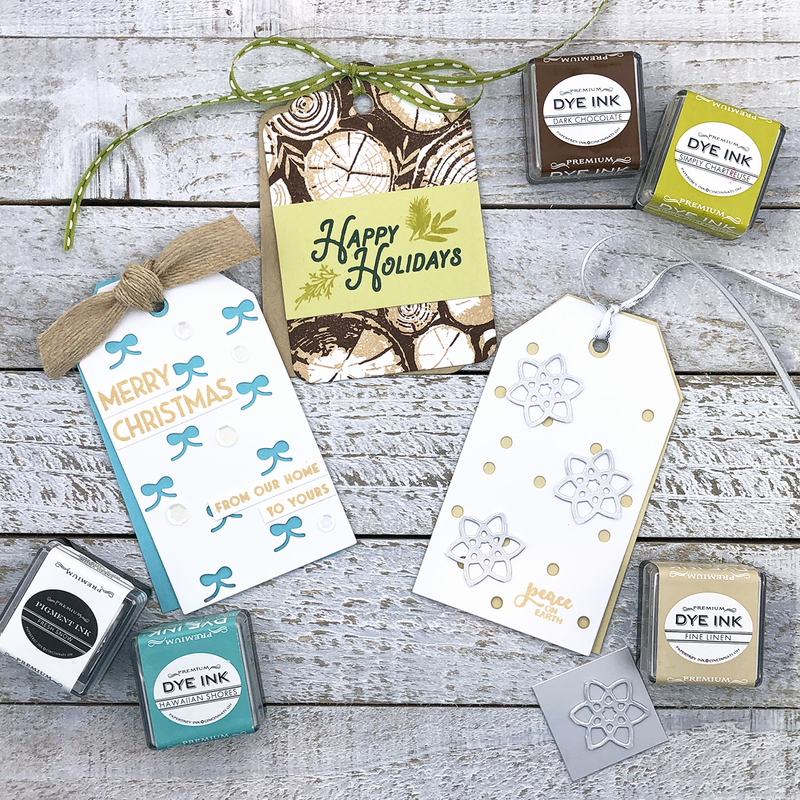 Again, a Pitter Pattern Tag Die is perfect for layering color, even when one of those colors is white. In keeping with parchment/Fine Linen taking an accent role, I added it only in the sentiment and ribbon, covering as little Hawaiian Shores as possible. A scattering of white sequins adds a bit of bling and finishes the tag off perfectly. a crafter since crayons, a computer nerd since the early apple, a hostess with the mostest, a maker of stamps and cards. graphic designer, teacher, mom of two girls. 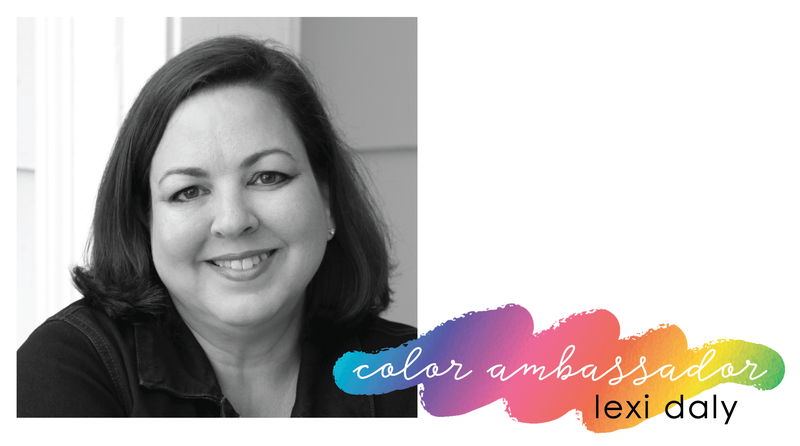 I adore Lexi’s color lessons and can’t wait for them every month! 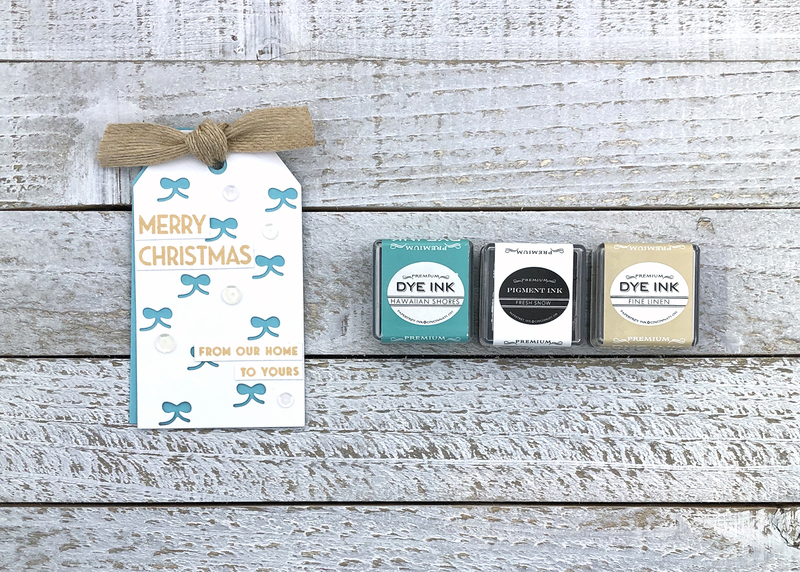 I love the idea of adding neutrals to holiday palettes, and I’m going to think about how I can do this with traditional Hanukkah colors of blue and white and silver. Thanks so much for the inspiration! Such a fun post, Lexi! 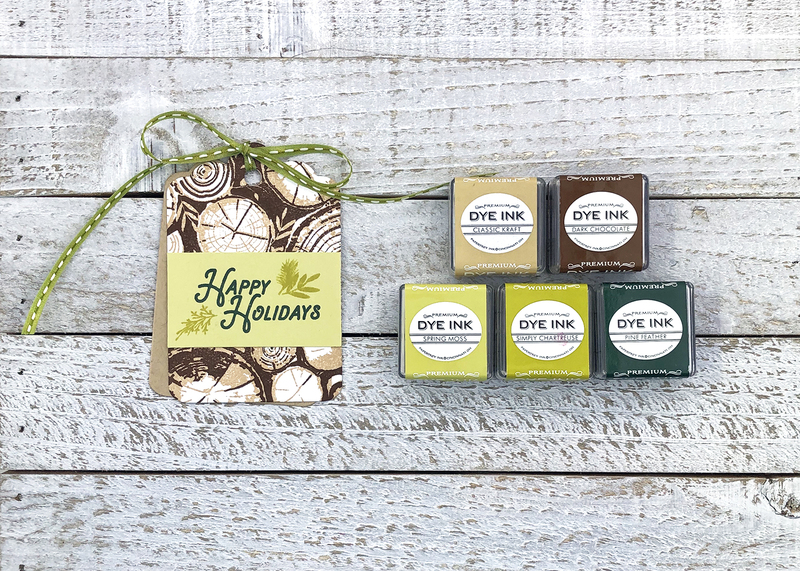 Love your ideas for using these wonderful natural colors for Christmas projects!